A day of mixed emotion. For most of us it’s mission accomplished and comes with a sense of pride from getting to the finishing post but it is also the last day of the Rally, the end of the adventure and the day we start to think about leaving the tight knit group we’ve found ourselves attached to for the last month. Pulling out of Mandalay this morning though we still had the day ahead of us and were determined to make the most of it. Our route took us through the old jade quarter where we can report that the life-size Buddha carving industry is in rude health and quickly made our way to the famous U Bein Bridge, the longest teak bridge in the world where we can report that the trinket selling industry is equally robust. Fresh from haggling and bartering we resumed the now familiar task of dodging Buddhist monks and nuns as we headed out to the freeway for the first part of the journey to Bagan. The day featured only one Regularity section, the final one of the rally no less. It was short savannah like drive to a water crossing where Joost van Cauwenberge showed just how much water a Toyota Landcruiser can displace. Once we’d dried out then it was on to lunch at the excellent Popa Resort which overlooks the citadel of the Popa Mountain a 740m volcanic plug crowned by a gilded temple. It’s a significant shrine in this devout country but luckily none of us had time to climb the 777 steps to the top. 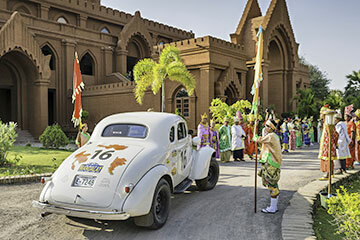 Timing was relaxed enough today to allow for a some sightseeing though before the final 55km drive into Bagan and the ceremonial finish complete with a Kyeezee, some twenty costumed dancers and a two man dancing elephant. So, on to the results. Our earlier leaders, Peter and Zoe Lovett have snatched victory back by a mere one second from overnight leaders Gerry Crown and Matt Bryson in the Classics category. Has there ever been a tighter result at the end of an three week long Endurance Rally? Answers on postcard please. Bill Shields meanwhile hammered home his advantage in the Vintageant category. Nestled among the temples of Bagan the hotel we find ourselves in tonight is stunning. The situation, the service and the company is second to none. 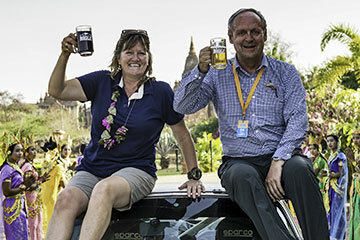 We’ve handed out the prizes made the speeches and are now looking forward to the famous balloon flight over the temples at dawn tomorrow morning. What we’re not looking forward to is getting up and 4.30 am to do it.